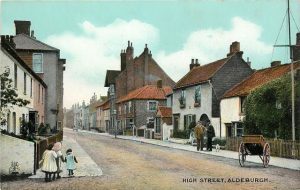 Apart from the fact that the angles of the two shots are different, on the near left, the row of cottages, and the taller building beyond, have hardly changed. Back in 1901 the row of cottages was known as Emeny Cottages. In the first image, the middle cottage, 3 Emeny Cottages (96 High St) would have been the Tailors Shop run then by Ernest William Block. 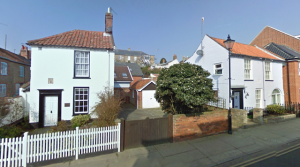 1 Emeny Cottages (92 High St), where the children were standing, is now known as Bee Cottage. The story is very different on the right. Near right, the building with the mast in the first image was superceded by Wards Garage, now Wards Place. The very tall building was the former Post Office (105 High St) which as you know from our first ‘Then & Now’ was destroyed by bombs in WW2. Coming back towards the Town Steps, 103 and 101 High St have also been rebuilt. One building clearly present in both images is Bell Cottage (93 High St), built in 1805 with a distinctive arch feature. The protruding single storey building just beyond was a book store. 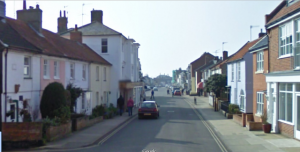 That and the former cottage at 97 High St have gone leaving 99 High St standing quite alone (see below).